Cheesy Chicken Fajita Pasta is packed full of perfectly seasoned chicken, loads of fresh veggies covered in a creamy, flavorful sauce. This dish comes together in no time and makes an easy weeknight dinner. 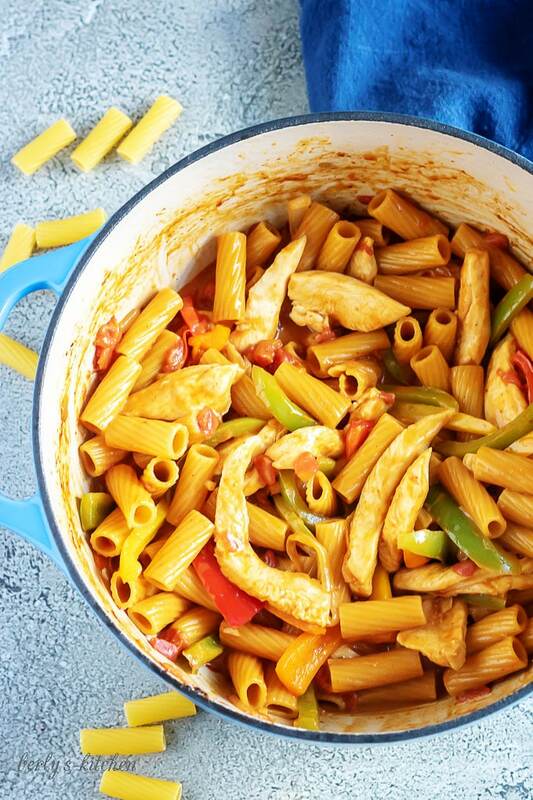 It’s so good, you’ll want to add chicken fajita pasta to your weekly menu! *This post may contain affiliate links. If you purchase an item after clicking one of those links, we may receive a small commission. Pasta is one of our favorite meals. It’s so easy to make, and there’s so much variety. Not to mention, it’s great for those nights when you’re tired and need to get something on the table quickly. One of our go-to’s for a tasty weeknight meal is this one pot spaghetti. For something a little more elegant, we opt for chipotle chicken pasta or a simple bechamel sauce. Lately, we’ve been adding some Tex-Mex flavor to our pasta dinners. 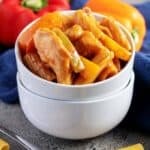 Cheesy Chicken Fajita Pasta has all the great flavors of chicken fajitas mixed with pasta noodles and a creamy sauce! 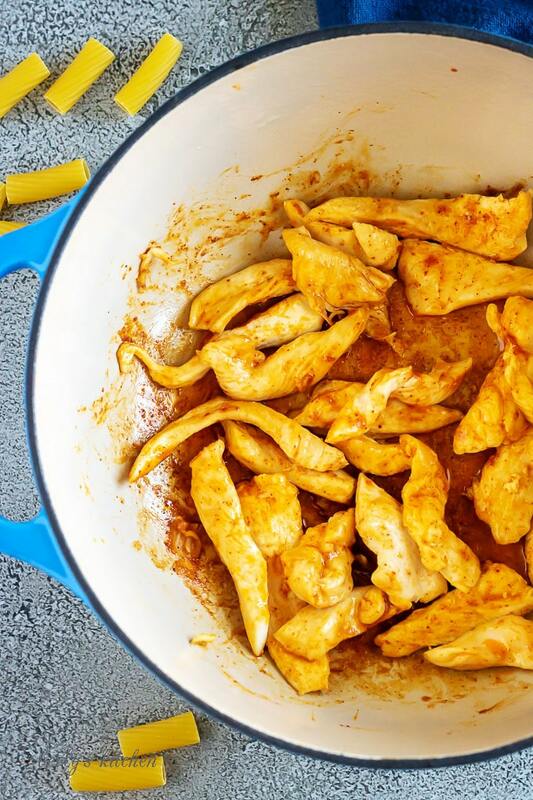 Here’s how we make our chicken fajita pasta! It’s super easy. There are a couple different variations that I’ll mention in the “Tips” section below, so don’t skip over it. Start by cutting the chicken into strips. These should be thin strips similar to the chicken you’d find in a fajita. If the strips are really long, cut them in half. Use one third of the fajita seasoning to season the chicken. Meanwhile, heat a large skillet, stock pot, or Dutch oven over low-medium heat. Add one tablespoon of olive oil to the pan. After the oil gets hot, add the chicken. Allow the chicken to cook for 2 to 3 minutes on each side before flipping. After the chicken cooks all the way through, remove it from the pan and set aside. There will likely be some seasoning and small bits of chicken stuck to the bottom of the pan. Don’t worry! That’s ok. There is a ton of flavor in those pieces, and it will come off when the pan is deglazed. Add the remaining tablespoon of oil to the hot pan, then add the peppers and onions. 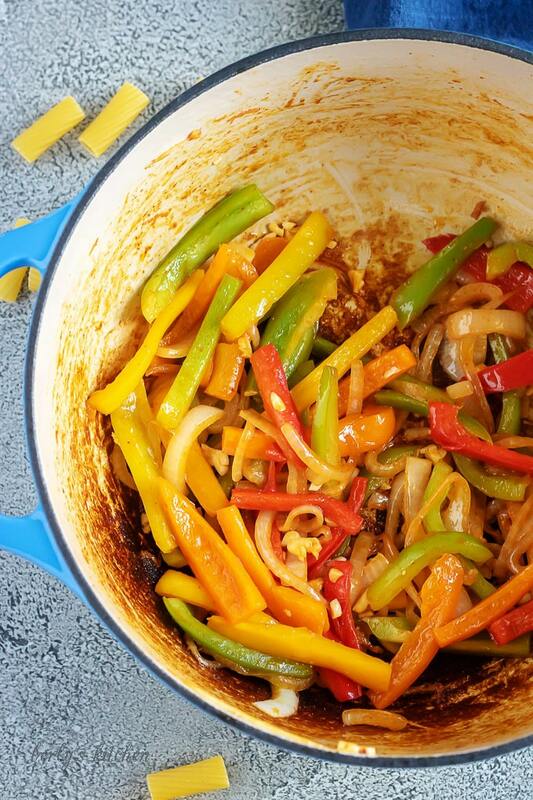 Sprinkle half of the remaining fajita seasoning onto the vegetables. Cook the peppers and onions, stirring frequently, until the onions become translucent and the peppers start to become soft. Add the garlic to the pan, and cook for an additional thirty seconds. Any longer, and the garlic may burn. Remove the peppers, onions, and garlic from the pan, and set aside. Carefully pour the chicken broth into the hot pan. Use a wooden spoon to scrape the bottom of the pan if needed. Next add the heavy cream, tomatoes and green chiles, and remaining fajita seasoning. Give the ingredients a good stir until they’re well combine. Pour the uncooked pasta into the liquid, and stir to ensure all the noodles are submerged in the liquid. Turn the heat up to bring the ingredients to a simmer. Stir the noodles occasionally to prevent sticking and to make sure they cook evenly. Cook the pasta under the noodles are tender. This took about 12-15 minutes on my stove, but every stove is different. It may cook faster or take longer in your kitchen. After the noodles cook, add the chicken and vegetables back to the pan. Stir to combine, then add the cheese. If there’s very little liquid left in the pan, the cheese may try to stick to the bottom. Try to leave a little liquid so the cheese will have something to melt into. This also makes a creamier sauce. Serve hot! I promised some variations for this recipe, so here they are! Can’t find fajita seasoning? We like this kind and this kind. Taco seasoning is a great substitute, too! We used rigatoni for this recipe, but you don’t have to. Any tube pasta will work! Penne, ziti, or campenelle make great options. Don’t like chicken? Use beef instead! This dish would taste awesome with strips of beef instead of chicken. You might notice that we used the fajita seasoning in thirds to season the chicken, veggies, and sauce. If that seems like too steps, simply dump it into the sauce all at once. Concerned about the amount of sodium in this dish? Swap the regular chicken broth for low-sodium. Look for sodium-free or low-sodium fajita seasoning. Cut back on the amount of seasoning to reduce the amount of salt. We love to use pepper jack or Monterey Jack cheese. However, we encourage you to use your favorite whether that’s cheddar, gouda, white cheddar, or something else! 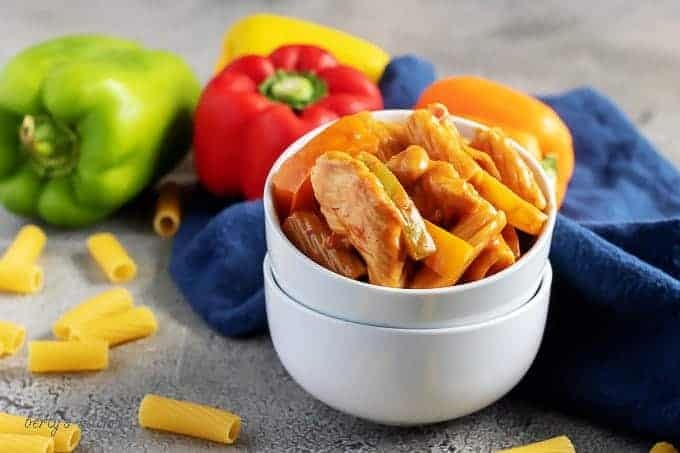 If you like this chicken fajita pasta recipe, please leave us a comment and rate the recipe card. You can also find us on Facebook, Pinterest, Twitter and Instagram searching for Berly’s Kitchen! 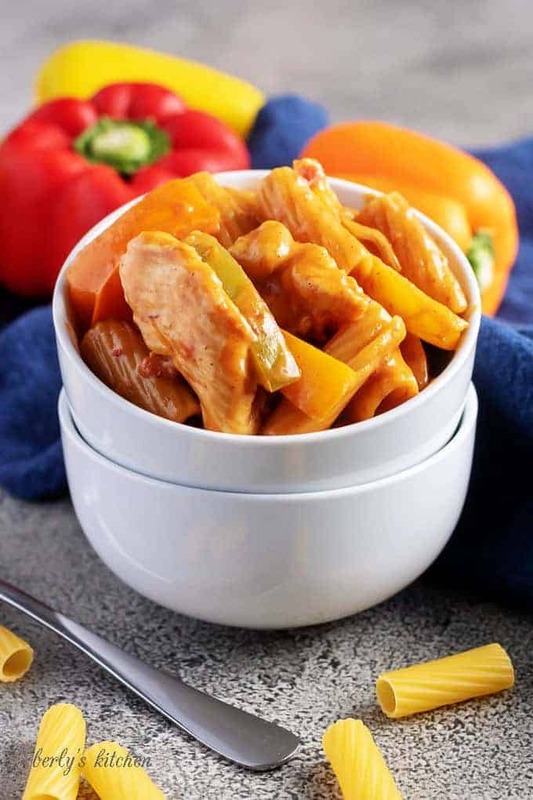 Cheesy Chicken Fajita Pasta is packed full of perfectly seasoned chicken, loads of fresh veggies covered in a creamy, flavorful sauce. This dish comes together in no time and makes an easy weeknight dinner. It's so good, you'll want to add chicken fajita pasta to your weekly menu! In a large skillet, stock pot, or Dutch oven, heat 1 tablespoon of olive oil over low-medium heat. Season the chicken with 1/3 of the fajita seasoning, and place in the pan. Allow to cook on each side for 2-3 minutes. After the chicken cooks thoroughly, remove from pan and set aside. Add the peppers, onions, and half the remaining fajita seasoning to the pan. Stir occasionally, and cook until the onions are translucent and the peppers begin to soften. Then, add the garlic. Cook for an additional 30 seconds. Remove the ingredients from the pan, and set aside. Next, pour the chicken broth into the pan, and use a wooden spoon to scrape away any pieces of chicken that may be stuck on the bottom of the pan. Add the heavy cream, tomatoes and green chiles, and the remaining fajita seasoning. Stir the ingredients and increase the heat to bring to a simmer. Add the pasta to the liquid mixture and stir to ensure all the noodles are submerged. Continue to stir every couple of minutes, so the noodles cook evenly and to prevent sticking. Cover and cook until the pasta is tender (about 12-15 minutes) while leaving a small amount of liquid in the pan. Add the chicken and veggies back to pan, and stir to combine. Next, add the cheese, and stir. Serve hot! Store any leftovers in the refrigerator for up to 3 days. *See the "Tips" section in the post for best practices and variations for this recipe. *The serving size and calories listed are an approximate calculation.